The first snow arrived few days ago and it is dark and cold outside. It is a perfect time to start planning for the next spring. I want my geraniums to bloom early in the summer and this is a right time to start growing them. There are so many varieties which makes it hard to choose. This time I ended up buying three different colors. The ones I ended up with were Maverick White, Maverick Scarlet and Nano Pink. I have never grown these varieties before so I am excited to see what I end up having. At least the start has gone well. Germination was supposed to take two to three weeks but it only took three days which took me by surprise. Geraniums are so easy and thankful flowers. The bloom all the time and tolerate heat and cold. It is the end of November and I still have one blooming in my balcony. It has survived the heat of the summer and first frost. PS. 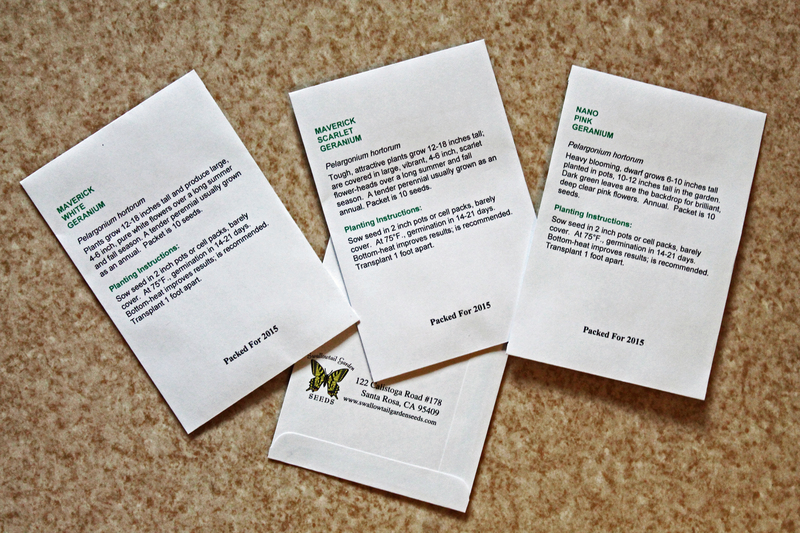 I bought my seeds from Swallowtail Gardens and each seed germinated and have been happy with my purchase. My addiction! If there would only be one flower I could grow, it would be aquilegia. I am simply compelled by them. When I was a child there were always pink aquilegias in my grandmother’s garden. Now the garden belongs to my mom and the aquilegias are still there. I loved collecting their seeds and sprinkling them around. The aquilegias were there and you never knew where they were going to grow next. That is what they do. Aquilegias wonder around your garden. They spent few years in one place and then they pop up somewhere else. Few years ago I decided that I want to see more variations. Pink was not enough for me. I wanted more. Aquilegias do not bloom during the first year up here in the north. So patience is needed. You see the results early in the second year. Luckily aquilegias are not that sensitive to our harsh winters. My rewards for this summer were Yellow Queen and Red Star. Aquilegias like to mingle. In other words if you place different varieties close to each other they crossbreed. So you never know what kind of flowers you going to get from the seeds. To make sure that I still have my grandmothers beautiful pink aquilegias I have placed some of them far away from the others. I just keep on buying more seeds – different colors, different shapes and sizes. Next year I am hoping to see White Star and Nora Barlow blooming. This is an addiction I want to nurture. PS. I have acquired my seeds from several stores. The one I like is seedaholic.com. They have quick delivery and good instructions for planting. I like planting the seeds early in the spring and directly to the place I want them to grow on. Aquilegias do not want to be moved around.